George Keith, president of Westport Resources, left, and John Vaccaro, the founder and owner of the financial advisor that is celebrating 25 years in business this October. The troubled waters of this economic downturn, with its credit crisis, flat housing market and Ponzi scheme scandals, has been difficult to navigate even for the most experienced financial sailor. While many companies have appeared rudderless, struggling to stay afloat, some going out of business while their principals are going to jail, and some losing credit or credibility or both, one local, independent investment firm has remained on course for almost 25 years. The award-winning Westport Resources has weathered several national and global economic storms better than many similar companies because, it claims, of the leader at the helm and because of his unique business philosophy. John Adams Vaccaro formed Westport Resources in 1986 and the company has continued as a model of stability, even through the market crash that occurred a year after going into business for himself and through this most recent financial turbulence. Vaccaro went from managing Broadway shows to managing assets and helping people realize their dreams. "I wanted to have a parallel interest with my clients. I wanted to be able to make decisions based on what was right and still get paid for it whether that meant buying or selling or doing nothing. That was kind of unique back in 1986 and now the whole industry is trending in that direction," said Vaccaro, whose office walls are adorned with sailing prints and photographs. "A sailboat is all about changing your whole perspective. There's so much focus on the economy, investments and achieving goals. It's stressful. When you're on a sailboat, not racing but cruising, you're in tune with nature because you have to be. You have to know where the wind and tides are; you have to keep an eye on the weather. You can be out on the water for 24 hours and you feel you've been away for a week," he said. One of Vaccaro's first clients came to his office enroute to a nearby hospital because the wife was in labor. "Do you have a watch with a second hand? Would you mind timing my contractions?" the woman asked Vaccaro. "They felt this was a good use of their time so we were doing educational planning for the baby that was going to be born," Vaccaro said. Eighteen years later, Vaccaro went to the high school graduation of the clients'daughter. "I told that story at her graduation party and how happy I was that she was actually going to have the money to go to college because of the work that we did 18 years before," Vaccaro said. Vaccaro and his staff develop and maintain such relationships with their clients, which they credit in part with their success. "If you were a client at most firms you would come in and you would sit with a piece of paper and we would say, `This is what you own and this is how it's performed.' But here, you can have that discussion with a manager sitting right there telling you about their view in the market and what's happened and what they're planning to do in the future and that's a distinct advantage," said firm President George Keith. 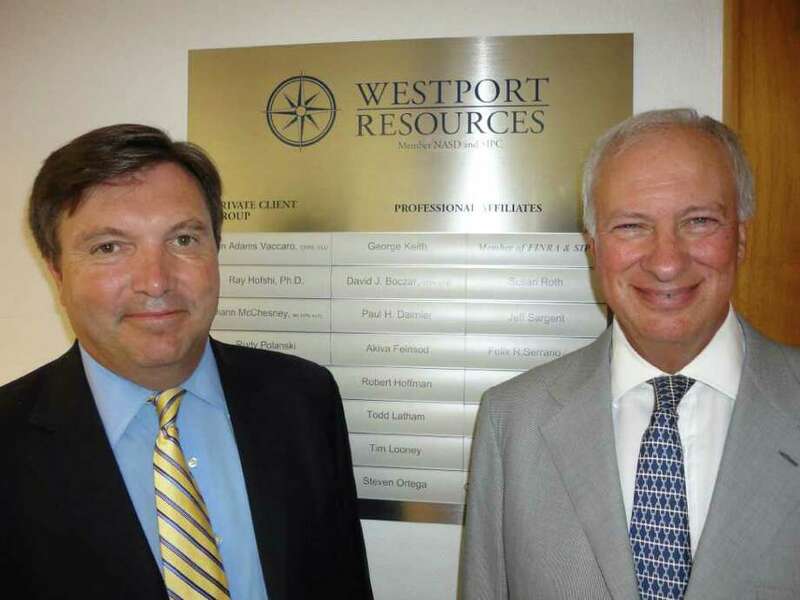 Westport Resources has a billion dollars under management; the company has grown from three employees to 60; and throughout the company's nearly 25 years there have been "no embarrassments," only hundreds of very happy clients, said Keith, who has 30 years experience on Wall Street. What happened with clients of Bernie Madoff, many of whom lost their life savings, could never happen at Westport Resources, Keith said. "We have a separate company that is owned by the Bank of New York Mellon, which is the highest rated bank in the country. They send the statements to our clients," Keith said. "If you self clear, if you process all your transactions, there is an opportunity for you to mask what's going on. There was a lack of transparency in Madoff's company. At Westport Resources we are fully transparent," said Keith, who joined the firm a year ago. Vaccaro was one of Keith's clients and he asked Keith what he dreamed of. Keith had always worked for someone else and wanted to work for himself. He bought into Westport Resources and together they are growing the company. "We have a private wealth business that John oversees and we also have a broker dealer so other advisors, brokers can come and work in this infrastructure," Keith said. "We have created two restaurants off the same kitchen. We run the private client group off of it and we run advisors' business off of it. It works masterfully and it's very efficient," Keith said. "Our assets are way up. Our assets are up 28 percent in eight months," Keith said. "We were told by our clearing company that they have 1,100 clients and we are in the top five for net growth," he said. That doesn't mean it has always been smooth sailing in the last quarter century, though. "We're growing our market share. We're profitable. I wish it was immediately flowing as strongly to the bottom line but we're growing, we're strong, and we're consistent. When times get better we'll see the impact to the bottom line," Keith said. Westport Resources has created some investment strategies that produce results for its clients and has garnered the company many awards, including some of the highest honors in the market. Five of the company's investment strategies have received five stars from Morning Star, one of the major financial rating companies of mutual funds and investment strategies. Westport Resources has also been named to Barron's list of Top Dogs, the top money managers, and Vaccaro -- for the second year in a row -- was listed in Barron's among the Top 100 registered investment advisors in the country. Vaccaro said the community of Westport has provided him a great way to make a living and he gives back through charitable donations and volunteer work. He has served on the Westport Country Playhouse board, including as president during the $32 million fund-raising effort to redo the playhouse. Vaccaro has also served as treasurer of the Hall-Brooke Behavioral Health Services board, and still sits on the investment committee for Fairfield County Community Foundation.